Undercover footage from Harmondsworth. Footage: Corporate Watch. U.K. asylum seekers have gone on hunger strike to protest living conditions at Harmondsworth immigration detention centre, which is run by Mitie, a British outsourcing company. The protests come months after Mitie took over from the Geo Group whose contract was canceled afterprison authorities found repeated problems. 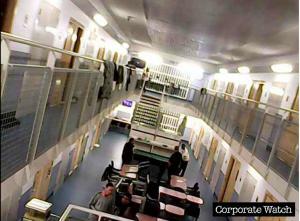 Mitie (which stands for Management Incentive Through Investment Equity) was awarded a £180 million ($270 million) eight year contract by the UK Home Office last year to manage the 615-bed Harmondsworth facility and merge it with the Colnbrook detention centre which is situated next door. The company won the bid despite the fact that it had almost no previous experience managing such facilities, apart from a 2011 contract to run the Campsfield site in Oxfordshire, where a major fire, multiple suicides and three mass hunger strikes took place under the company’s watch. The researchers also reported that Mitie staff were being forced to work 13.5 hours a day. Other footage released by Corporate Watch showed a detainee who had apparently collapsed from epileptic fits twice within a fortnight. The organization also reported that another “very depressed” detainee set fire to his cell. “It’s just gonna break. There’s only so much people can take,” a Mitie employee was filmed saying on undercover footage. Harmondsworth has often been the site of mass protests over abusive conditions. In 2006, riot police were brought in to quell disturbances. Last May when the center was still under control of the Geo Group, some 300 detainees also went on hunger strike. *Corporate Watch is a UK charity that is not affiliated with CorpWatch, which is based in the U.S. The two organizations were founded independently but share similar missions and visions.